The SJAA has taken possession of a new Lunt solar scope. 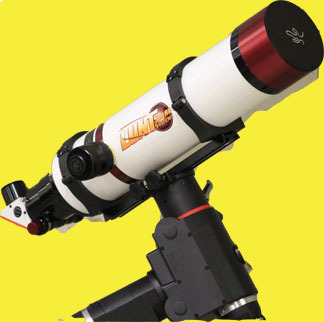 This scope gives excellent views of the sun. There are several good reasons to consider solar viewing in the next few months. First, there is an increase in solar spot activity as we head toward the most active part of the 11-year solar cycle within the next few years. Second, there is an annular (ring-like) solar eclipse coming on May 20, 2012. The moon will cover just under 90% of the sun as viewed from San Jose (the maximum coverage for this eclipse will be about 95% and you can see that from Redding or Reno). Third, June 5 is the transit of Venus. If you miss this transit, the next one will be in 105 years. Set your day planners accordingly. Of course, the sun is always an interesting object when viewed through an instrument like this where the filtration can be finely tuned to maximize the views of prominences and sun spots. Solar viewing at Houge Park is available from 2-4 p.m. on March 4, April 1 and May 6, weather permitting.